Keep food and food workers safe. 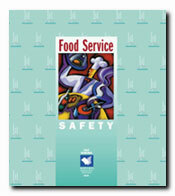 This new kit is for anyone concerned with keeping food and food workers safe. These pages show how to prevent contamination, maintain clean work habits and avoid common mishaps such as cuts and burns, fires, back injuries, slips and falls. Seven copy-ready safety reminder posters are included. This kit is also available in Spanish and Bilingual versions!